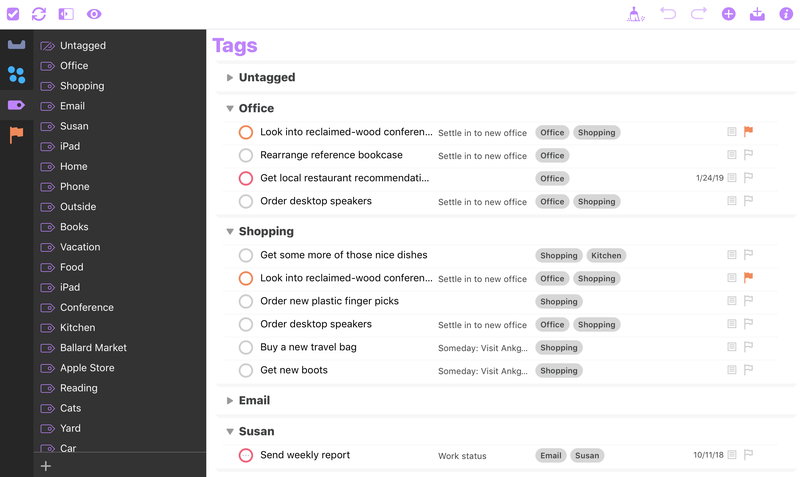 OmniFocus for the Web — a browser-based companion to OmniFocus for Mac and iOS — includes the core OmniFocus features: you can check off actions, add new actions, view your projects and tags, and plenty more. There are four built-in perspectives: Inbox, Projects, Tags, and Flagged. To get to Inbox, if it’s not already open, click the blue inbox-looking icon at the very top of the sidebar (the black strip on the left). In Inbox you can enter new actions for later processing. 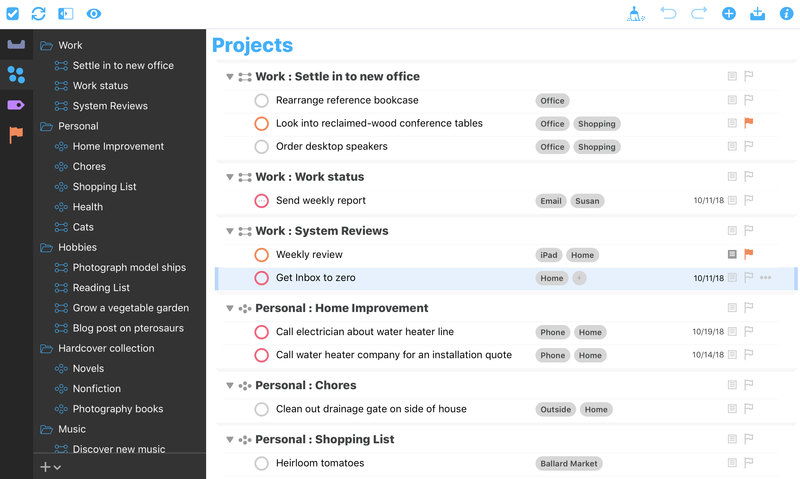 It looks as you’d expect — it looks like OmniFocus for Mac, by design, which means it will be familiar to Mac users. Click the + button at the upper-right of the window to add a new action. You then have a “New Task” item, ready for editing. 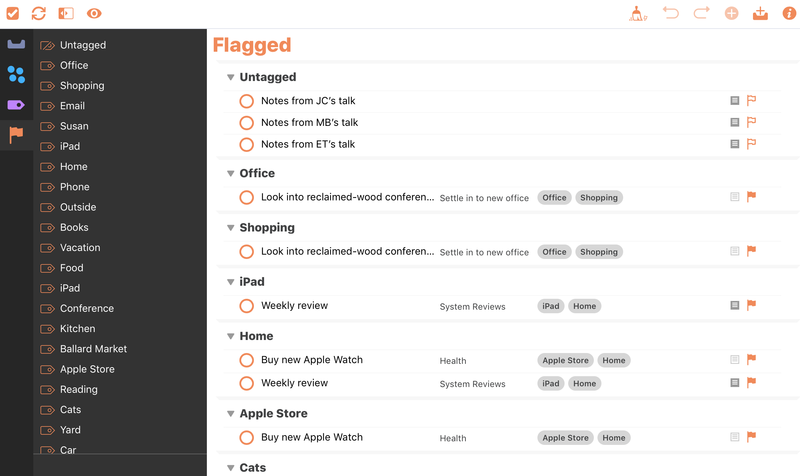 You can set its project, add tags, set a due date, add a note, and flag it, all in the task editor. The … button at the far right adds additional commands: you can create another new action or delete this one. And, most importantly, you can mark actions as completed — check them off! — as you’d expect: click in the circle at the left side of the action. Now — and this is key — you don’t have to edit all of an action’s data inline. If it’s easier to use the Inspector, you can. If it’s not already open, click the circle-i button at the very upper-right of the window to open it. The inspector is, again, very similar to the inspector in OmniFocus for Mac: it’s almost a clone. You can edit an action’s title, status, project, flag, tags, dates, and note in the inspector. The second built-in perspective is Projects: click the four blue dots in the sidebar to open it. You’ll see all your projects, including folders and sub-folders (if you have any). You can expand and collapse in the sidebar and in the action list. You can edit projects (inline and via the Inspector), add actions (via the toolbar + button), and edit actions. You can even drag and drop actions to move them. To create new projects: at the very bottom of the sidebar is a + button with a popup menu. Click it to create New Parallel Project, New Sequential Project, New Single Action List, and New Folder. This perspective shows you all your tags. Select a tag to see all the actions for that tag. To add a new action to a tag, or to delete a tag: select it, then click the … button at the far-right: you’ll see a menu with New Action and Delete Tag. To edit a tag name, click it in the sidebar — you can edit it inline. Or you can edit its name in the Inspector. The last perspective shows your flagged items. It lists your tags in the sidebar. Select a tag to see all the flagged items with that particular tag. To go back to showing all — with no tag selected — just click again on the flag button in the sidebar. You can edit the flag for any item — here as in any perspective — by clicking the flag button on its row, or by selecting it and clicking the flag button in the Inspector. At the upper-left in the toolbar is an icon that looks like a checkbox. Click it to get a menu: About OmniFocus Web, Reference Manual, Contact Omni, Release Notes, and Sign Out. Next to that is a chasing-arrows icon: click it to sync right away. Normally this isn’t something you’d have to do, but it’s there just in case. To the right of that is a button for opening and closing the sidebar on the left. On smaller screens it can be useful to hide it. Then jog all the way across the whitespace… to the broom icon: the Clean Up command. It removes items that can be removed from the current perspective. To its right are a pair of circular arrows: the one on the left is Undo; the one on the right is Redo. Then there’s the circle-plus button, mentioned earlier, which creates a new action in the current location. And, finally, there’s the previously-mentioned Inspector button. 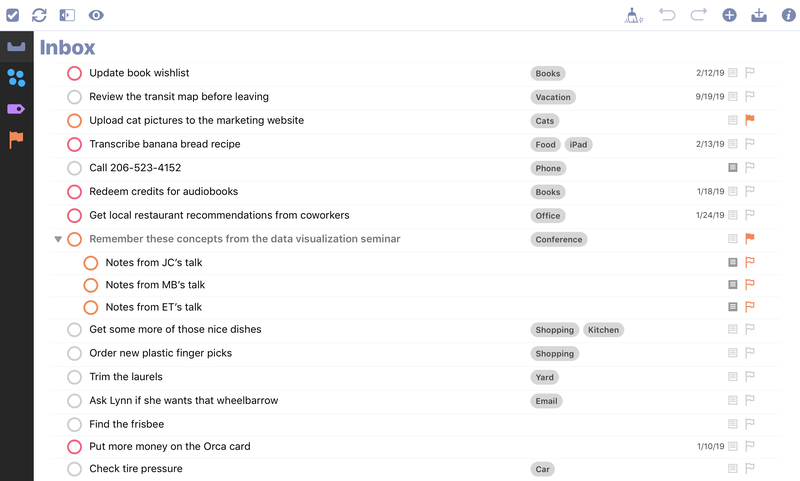 This is a first release of OmniFocus for the Web. It’s obvious that we could add more features — but first we want to learn how our customers use it; we want to learn more about what they need and want. So be sure to let us know! Click on the checkbox icon in the upper-left and choose Contact Omni. And keep watching the Omni blog for news about updates and new features.